"I love the tango a lot. It is something that comes from inside me." This is what Card. Jorge Mario Bergoglio declared in 2010 in an extensive interview published in the book The Jesuit by Sergio Rubin and Francesca Ambrogetti. 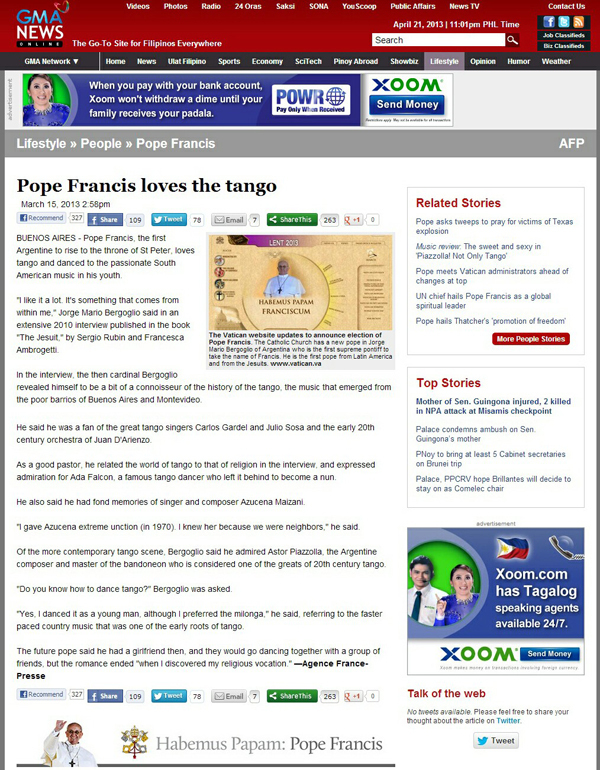 Bergoglio revealed himself to be an expert in the tango's history. He is a fan of the great tango singers Carlos Gardel and Julio Sosa, as well as the contemporary composer Astor Piazzolla. You can find a photocopy of this news report by France Presse in the last row below. For more information you can read a report in Italian here. Despite the preferences of Pope Bergoglio, the tango was considered to be opposed Catholic Doctrine because it is a very immoral and sensual dance, as shown in the first and second rows below.